In Meow! 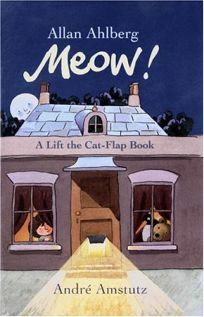 A Lift the Cat-Flap Book by Allan Ahlberg, illus. by Andre Anstutz, a girl waits for her pet to return through the cat door; he does, but not before a porcupine, Teddy bear, robot and more greet readers who open the cat door (lift the flap).